This beautiful colorful liuli Laughing Buddha pendant will help to sweep away your worries, stress, problems, anger and sadness. 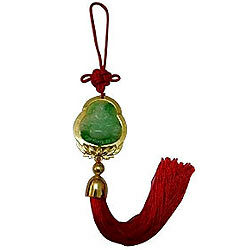 The Laughing Buddha also helps usher in good fortune, prosperity and wealth luck. An excellent gift for those working in stressful environment. Suitable for everybody, the patriarch, the matriarch and the children.